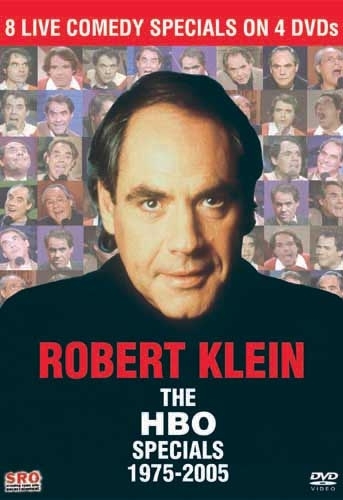 For the first time, all eight of Robert Klein’s hilarious HBO Comedy Specials are available on DVD in this complete Special Collector’s Edition 4-DVD Box Set. 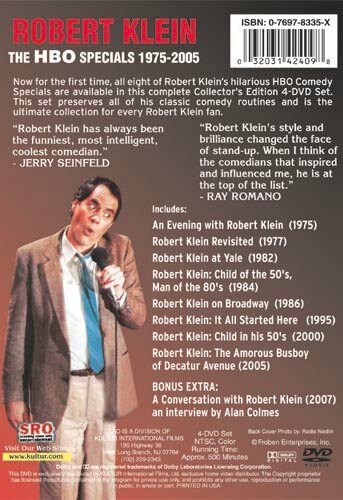 This set preserves all of his classic comedy routines and is the ultimate collection for every Robert Klein fan. Robert Klein: The Amorous Busboy of Decatur Avenue. “The programs demonstrate that Klein, who has remained a sharp, observant commentator on ordinary life and contemporary events was a pioneer of modern situational comedy as well as a master of topical humor. Highly recommended." “Robert Klein's style and brilliance changed the face of stand-up. When I think of the comedians that inspired and influenced me, he is at the top of the list." "Without a doubt, Robert Klein is one of a kind and this collection will make a fine addition to your DVD library, just as funny 30 years from now as it is today."